Come visit the Old West, the land where gang initiations, ride-by shootings and territory disputes got their start. But these tales aren�t the ones your grandpappy spun around a campfire, unless he spoke of soul-sucking ghosts, steam-powered demons and wayward aliens. 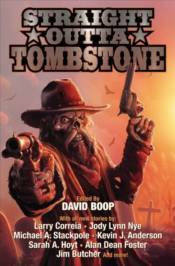 Here then are seventeen stories that breathe new life in the Old West. Among them: Larry Correia explores the roots of his best-selling Monster Hunter International series in "Bubba Shackleford�s Professional Monster Killers." Jim Butcher reveals the origin of one of the Dresden Files' most popular characters in "Fistful of Warlock." And Kevin J. Anderson's Dan Shamble, Zombie P.I., finds himself in a showdown in "High Midnight." Plus stories from Alan Dean Foster, Sarah A. Hoyt, Jody Lynn Nye, Michael A. Stackpole, and many more. This is a new Old West and you�ll be lucky to get outta town alive!